Two other pennies were found- one in school and the other on the stairs. Fortunately for us, hubby found a soggy dollar bill in the slushy snow. I think the five dollar bill (the first paper find for 2007) is calling out for more companions. Hubby lovingly tended to the dollar and nursed it back to health. Welcome to the changepot, mr. bill !! The first paper find of 2007! Congrats to Sandy Cheeks- she found a five dollar bill today! She also found a penny and a bridge token. The token is going into the foreign currency jar. This is Sandy's second paper currency of her life- the first was a ten and a one as we walked home from the grocery store. This was approximately two years ago. This five dollar find is our first paper entry for 2007- YAY! I also found a penny while on the way to pick Sandy up from school. Also, I forgot to add six cents from the other day. I've been idle on this blog due to the snow situation. Now that the snow is partially melted, i'm sure we'll find more change in the coming days. Today we found $0.33 cents- four nickels, a dime, and three pennies. All four nickels were found in front of my house as the snow thawed out. I found one on my way back from the gym (figured it was the change guru's way to commend my efforts) and the other three while running various errands throughout the day. Hubby found the dime and pennies at work. I have a very funny cough but it's not quite as comical as my husband's. His sounds like muttley from the old hanna barbera racing cartoons... (wow. i'm showing my age here). A trip to the mall proved worthy. We found a total of $0.30- two dimes, a nickel, and five pennies. The kids are still under the weather.. and now I too am infected. Joy. Found six($0.06)cents so far.The Keyboard is still unhappily under the weather. It's still quite early so I may have more to report later. UPDATE:::::::::::::::: Add $0.43 courtesy of various spots in New Jersey. Found thirty four cents in school today. My keyboard is acting up. Hopefully it willfeel bettertomorrow. My apologies for not updating as much as I'd like- the snow/ice has pretty much limited our capabilities for procuring found change. Yesterday (Thursday), Hubby found $.55 at work. Earlier this evening, I found $0.11 while buying tickets to go see "Ghost Rider" WHAT A FILM!! I actually liked it.. even though it didn't stick to the original comic book. Nic Cage was great... I could have done without the Eva Mendez boobage display. For accounting purposes, I'll add the two day total for today. Hubby and Mr. Rocco (of Piggy Bank) went out to the mall and found a few coins (34 cents worth) as Mrs. Rocco and I sang karaoke. Whitney Houston's "I will always love you" is alot harder to sing than I'd anticipated! 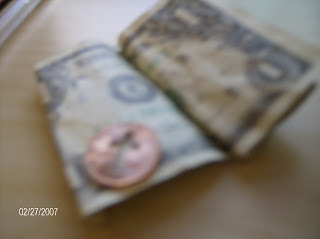 Hubby said Mr. Rocco found 28 cents- including a dime hubby spotted but was beat to the chase- all in all a good day. We've found a total of $1.13 in the past few days. Things have been rather hectic here at the homefront. Sick kids, messy house, all that fun family stuff. Hopefully I'll get back on track in the next few days! C-ya! Been out of commission this entire week. I do have some change to account for- thirty three cents worth (not even enough to buy a stamp BUT it still helps toward the changepot totals. I also received the interest statement for changepot 05'- chalk up another 1.35 for that fund right there. Hope everyone is staying warm! Yesterday and Today we found a total of $1.16. Since I didn't get a chance to separate the two day total, the accountability is a little off. Other than that, gotta go... SUPERBOWL TIME! The mall yielded $0.23 in total. Not much around here lately :(. A penny for someone's (school)thoughts. 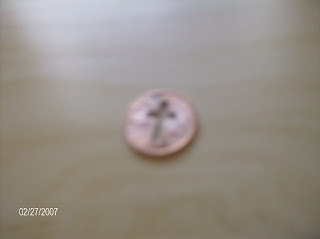 Today my daughter found a penny at school. Not much else to report.